hosted by Malika & Mr. J.E. 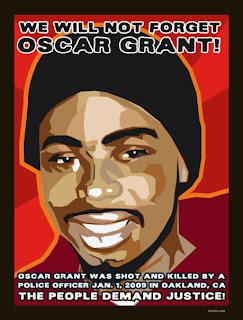 Oscar Grant, III would have been 23 on Friday, February 27th. CAPE coalition activists will be at BART stations, passing out fliers encouraging people to remember not only his death but his life. We invite you to join us - for an hour, for two hours, whatever you can give. Finally, we would like to encourage everyone to wear blue ribbons or armbands all day (blue was Oscar's favorite color). Bail for Officer Johannes Mehserle was set at $3 Million, meaning he only had to pay $300K to make bail and walk free. We've just been notified from Ron Dellum's office that bail was made, and Mehserle, who previously fled the state and had to be caught and dragged back here, could be out of Santa Rita. CAPE leadership is appalled, and grieving again. The police have thrown tear gas and concussion grenades into the crowd of Oaklanders gathered to hear the news and stand in solidarity with Grant and his family. Bail Hearing for Mehserle Jan 30! Please come and assure that Officer Mehserle does not flee while awaiting trial for the murder of Oscar Grant III. At Officer Mehserle's arraignment there was very little support from the community – but there were 25 police officers in the courtroom in support of Officer Mehserle. The battle is far from over, and JUSTICE will NOT be served if the community is not present. Our solidarity imprisoned Mehserle, and our solidarity will see to it that JUSTICE is served. Power to people! in Johannes Mehserle in the following inmate locator to verify. This day is to honor all those who have died or been injured by violence in the streets of Oakland and neighboring communities. We honor these mostly young men and women whether the cause of their death was police brutality, gang violence, domestic dispute or by accident. We've heard about successful events in Milwaukee, WI; Boston, MA; Pittsburgh, PA; Durham, NC so far. Reports, videos, photos and media will be posted below as we receive them! In Boston, over 30 young people braved the single degree weather to come together in solidarity with Oscar Grant III, the people of Gaza and resisters of oppression worldwide. Tears were shed as participants closed the event chanting, "I am Oscar Grant." Milwaukee, WI and Tallahassee, Fl invited the community to discuss the Oscar grant shooting and solutions to prevent future incidents from occurring. Video footage of the shooting (murder) and the peaceful non violent protest in Oakland, Ca was email blasted to thousands of people using face book, my space. Text and email blasts were also sent using data collected from Voter Pledges, Surveys, and Id's. * People caring enough to stand up for injustices & not just go back to work because it ain't they children. All People! On January 14 CAPE had a beautiful community event in Oakland, y'all! There were speakers, singers, preachers, organizers - amazing. Sean Bell's mother sent a letter which CAPE Co-founder Dereca Blackmon read to us at the rally. We pulled together security from the community and were able to really maintain the safety of the crowd throughout the event. The formal event ended, and folks moved out into the night. We hope the events across the country were as uplifting as the events here - we'll post updates as we receive them! 1. We want the immediate arrest, indictment, and prosecution of BART police officer, Johannes Mehserle for the murder of Oscar Grant III. We believe Oscar Grant III was maliciously murdered, robbed of his human and civil rights, and killed , in part, because of his race, class, youth, and dress which constitutes a classic case of racial profiling at best and at worst , a systemic BART philosophy of harassment, intimidation and violence as regards it patrons and citizens. 2. We want the release of the names and suspension of all the officers accompanying Officer Mehserle on January 1, 2009 at the Fruitvale BART shooting until a thorough and comprehensive investigation has taken place. We believe that Officer Mehserle’s actions were not a case of a ‘bad apple’, but indicative of a particular mentality and culture within BART police in particular and law enforcement in general that views young, black males as suspects, criminals, and enemies. 3. We want a public review of BART history, police policy, strategy, and philosophy to assess whether (A). BART police are really needed and (B). If needed, whether or not they need guns. We believe that the BART police force operates from policies and attitudes that are biased, militaristic, and racist and this philosophy is manifested in the actions and attitudes of its officers. Consequently, we recommend a citizen review of all such policies with the intent of creating a citizen review board to monitor excessive force, supervise implementation of diversity training and conduct an analysis on whether funds allocated for police might best be used differently. 4. We want BART, in the spirit of restorative justice, to make community restitution, in part, by funding community based healing centers throughout the city for grief counseling, conflict resolution, and healing. We believe that the murder of Oscar Grant III is the latest chapter and Oakland’s version of police, intra-community, terrorist and war violence that presently engulfs the planet. Only through concerted effort, understanding, and dedicated work and discipline can our city extricate itself from this madness. Institutions whose sole purpose is the healing of hearts (that have been wounded by violence) are needed throughout the world to show our communities, nation, and world that there is a better way. Greetings from Mr. And Mrs. William and Valerie Bell from the other side of the country, New York City! We would like to send our deepest condolences to you and your family for the sudden loss of Oscar Grant. As parents who have lost a son unexpectedly from the hands of the Police Department, we can definitely empathize with the pain and suffering you and your family are going through right now. You all are in definitely in our prayers, and we stand in solidarity with you as you all pursue the justice we are still trying to get for our son, Sean Elijah Bell. The senseless murders of our young people by the hands of the police have been going on for far too long now, and I am willing to do whatever I can do to make sure these incidents happen Never Again! As founder of a new organization, Mother of Never Again (M.O.N.A), we will make sure our voices will be heard, so that these policemen and politicians understand that our children are human beings, not some type of savages you hunt down in the woods! Ms. Johnson, if there’s anything I can do to further your cause, please let me know. Although we have a new administration coming to Washington, DC on Tuesday, the police brutality and murders of our young people—from Oscar Grant to Adolph Grimes in New Orleans—will not end unless we all take a stand! It is my hope that we can all come together and work to attain this common goal, and I pray that you will receive the justice that your family and Oscar sorely deserves. Again, you are in our prayers as you and your family go through this long and trying time. “God will get the Glory while Sean Elijah Bell gets his rightful story”….We hope Oscar will, too. Learn more about Sean Bell's murder. Today thousands of people are coming together across the country, Praying for Peace, Working for Justice. 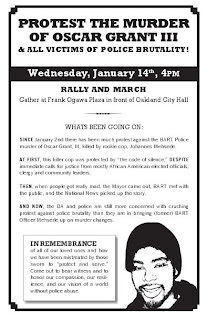 Please join us in Oakland at Frank Ogawa Plaza at 14th and Broadway, or in a rally near you. We will celebrate the arrest of Officer Mehserle, and demand full justice. Email us at joincape@gmail.com to let us know about your actions! We will update here as much as we can while the actions are taking place! Filipino-American Youth Denounce Police Brutality, Demand Jutice for Oscar Grant!!! Anakbayan chapters nationwide express our solidarity with the family and friends of Oscar Grant in their struggle for justice. We strongly condemn this escalating trend of systemic racial profiling and police brutality that too often results in murder. Oscar Grant and three other young men were snatched off the BART train on the Fruitvale Station in Oakland, California on January 1, 2009. They were sitting against the wall when officers pressed Grant face and belly down on the floor. Then, officer Johannes Mehserle stood up and drew his firearm and shot Oscar Grant in the back, execution style right in front of train passengers. The incident was captured by BART passengers from their cell phone cameras and has been circulated around the internet for thousands to view. A week passed and Mehserle remained unaccountable to the City of Oakland and Bart officials for the heinous murder of Oscar Grant. This incident indicates how these ill-trained police officers, unfit to serve and protect the people, go on a rampage with impunity. Oscar Grant is not alone. Countless more people of color have been brutalized or murdered by the police force across the country in a decades long government attempt to maintain state power by dividing and violently repressing the efforts of people of color to survive and organize. In 2007 in Oakland, CA, three Southeast Asian youth were wrongfully accused of murder in the nearby city of Alameda, CA. The police terrorized the entire Southeast Asian Oakland community by pulling high school students out of schools without parents consent and bringing in SWAT teams with automatic rifles looking for suspects at a youth leadership meeting. The Alameda Police Department wrongfully classified the 3 youth as gang members for dressing in black to mourn the death of soldiers during an anti-war mobilization from the student's myspace page. On Feb 5, 2007 in San Jose, CA, eight police officers participated in the beating of Marlo Custodio, an 18 year old Filipino student, while two other officers observed and did not interfere. Marlo Custodio was a senior at Evergreen Valley High School, who was very involved in his community and school programs. In Seattle, there has been increasing amounts of police brutality towards youth leading to several investigations into the police department. One such case was the shooting of an unarmed 13-year old Filipino youth in October 2007, mistaking a cell phone for a weapon. Many other cases exist of excessive force by plain-clothes police who do not identify themselves and physically attack suspected gang members. Several of these cases were recorded by cell phones or cameras exonerating the victims of any wrongdoing and showing the brutal and dehumanizing tactics of the Seattle PD. In New York and New Jersey, Alan Alda, an Anakbayan member was arrested and detained by Jersey City police after seeking their help against an erring cab driver on February 18, 2006. Just a few months later, on November 25, 2006, the horrific murder of Sean Bell happened. The unarmed Bell was shot fifty times by plainclothes and undercover NYPD officers on the day of his wedding. Also, on January 11, 2009, with the huge protests against the unjust invasion of Palestine by the US-backed Israel, 120 pro-Palestinian demonstrators were brutally arrested. We recognize police brutality as the domestic manifestation of the U.S.-led wars throughout the third world perpetrated against the vast majority of people in an effort to maintain U.S. imperialism. Police and military violence against innocent youth has plagued the Philippines from the dawn of the 70's through the present time under President Gloria Macapagal Arroyo. As the state-sponsored terrorism was escalating in the 1960's and 70's, the youth responded with massive street movements that broke the climate of fear instilled by the Marcos regime. This huge protest movement became known as the First Quarter Storm. This set the stage for EDSA People Power in 1986 which ousted Marcos and showed the collective strength of the youth together with the basic sectors of society. From 2001-2008, 18 youth leaders of Anakbayan and the League of Filipino Students in the Philippines have been gunned down just for exercising their right to speak out against the human rights abuses of the U.S.-backed and U.S. taxpayer funded Arroyo regime. Despite the terroristic tactics employed by the state, the youth refuse to be silenced and continue fighting for justice to this day. Now, more than ever, the collective strength of the youth is beckoned once again. In a time of great economic depression, proliferation of fear and injustice, and heightened levels of state repression, the youth need to come together, flex our power, expose state attacks on our human rights and demand accountability of the police force to the people. JUSTICE FOR OSCAR GRANT AND ALL VICTIMS OF RACIAL PROFILING AND POLICE BRUTALITY! LONG LIVE THE COLLECTIVE POWER OF THE YOUTH! 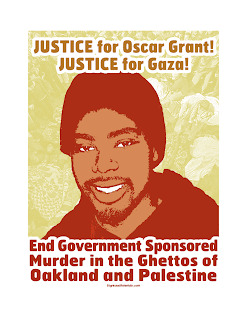 END GOVERNMENT SPONSORED MURDER FROM THE GHETTOS OF OAKLAND TO PALESTINE! Check out CBS-5 coverage with video! (01-13) 21:36 PST Oakland -- Johannes Mehserle, the former BART police officer who shot and killed an unarmed man on an Oakland train platform on New Year's Day, was arrested in Nevada today in connection with the shooting, The Chronicle has learned. Mehserle, 27, was taken into custody in Douglas County, Nevada, said Deputy Steve Velez of the Douglas County Sheriff's Office. The arrest was also confirmed by David Chai, chief of staff to Oakland Mayor Ron Dellums. Douglas County sheriff's officials refused to disclose what crime Mehserle was accused of committing in the arrest warrant. Deputy Velez said Sheriff Ron P. Pierini would make a statement on Wednesday. Alameda County District Attorney Tom Orloff was also expected to announce details of the arrest Wednesday. Efforts to reach attorneys for Mehserle were unsuccessful. The arrest comes on the eve of a scheduled protest at 4 p.m. Wednesday outside Oakland City Hall, the latest in a series of demonstrations in which BART has been accused of mishandling the shooting investigation. On Monday, BART police turned over the results of their preliminary investigation to Orloff's office. The separate investigation by Oakland police was launched last week. The state Attorney General is also monitoring the case. BART officers had detained Grant and several other passengers at about 2 a.m. on Jan. 1 as they investigated a fight aboard a train from San Francisco. Grant was lying face-down when Mehserle pulled his service weapon from his holster and fired one shot into his back. Mehserle resigned last Wednesday rather than answer questions from BART investigators. His departure came the same day Grant was buried and a peaceful protest at the Fruitvale BART Station erupted into violence in downtown Oakland. Demonstrators set cars on fire and broke windows at dozens of businesses. By night's end, police arrested 105 people. Chronicle Staff Writers Jaxon Van Derbeken and christopher heredia contributed to this report. E-mail the writers at dbulwa@sfchronicle.com and lfulbright@sfchronicle.com. & ALL VICTIMS OF POLICE BRUTALITY! Since January 2nd there has been much protest against the BART Police murder of Oscar Grant, III, killed by rookie cop, Johannes Mehserle. AT FIRST, the killer cop was protected by “the code of silence,” DESPITE immediate calls for justice from mostly African American elected officials, clergy and community leaders. THEN, when people got really mad, the Mayor came out BART met with the public and the National News picked up the story. AND NOW, the DAY and police are still more concerned with crushing protest against police brutality than they are in bringing (former) BART Office Mehserle up on murder charges. On Monday we had a national call for folks planning solidarity actions with the January 14th National Day of Nonviolent Action to Protest the Murder of Oscar Grant III (& all victims of police brutality) to share their plans. The event will be called 'Praying for Peace, Working for Justice'. If you didn't hear about the call, please don't be sad at us - we're trying to keep in touch with a lot of organizers locally and nationally, as well as the press. As you can imagine, it's a LOT to deal with. The good thing is, Wednesday is shaping up to be a beautiful, healing event with members from the faith, youth, organizing and small business community coming together with demands for justice. We have solidarity actions happening in 15 cities, including Atlanta, Boston, LA, and more. We've already had some small steps towards success, but we won't stop till our demands are met. Please check out www.ruckus.org/oscargrant for an action kit to help out if you are planning actions, and a list of participating cities and details about each gathering. Thank you for your support of CAPE, it is necessary and appreciated. FAMILY FUND: The family is working on setting up a Fund in Oscar's name, we will post the information as soon as it is available. You can also visit Facebook (Group: CAPE) for additional information. Who is Oscar Grant III? Oscar died leaving many to ask why was did this officer use excessive force? 7 days after the incident, Meherles has yet to be charged with the murder of Oscar Grant III and BART has yet to investigate the incident. 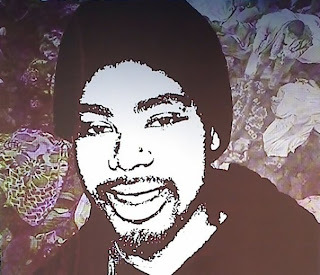 We demand for the criminal prosecution of ALL officers involved in the incident at the Fruitvale BART station that resulted in the death of Oscar Grant III. We demand that BART hand over this investigation to the CA State Department of Justice. We demand that BART provide the community a forum to voice their concerns and to present to the public, a policy that will ensure that this will never happen again. CAPE is a group of concerned organizers and individuals responding to the January 1 execution of Oscar Grant III, and all police executions. Breaking News: Mehserle Arrested in Nevada! FRI. JANUARY 16 9AM 9 a.m., in Department 112 of the Wiley M. Manuel Courthouse, 661 Washington St.
FRI. JANUARY 23 6PM BLACK DOT CAFE 1195 PINE ST, OAKLAND FREE “Town Bizness Townhall Meeting - Against Police Terrorism” Come hear from the family of Oscar Grant and from protesters, community leaders and artists All are invited. For more information, you could hit up www.blockreportradio.com and www.sfbayview.com.